Our Second Great War story line posits an alternative history in which the First World War (here called the First Great War) ends in early 1917 with a negotiated settlement. War returns a generation later, and in Royal Netherlands Navy we take a look at the Second Great War’s outbreak in the Far East. Royal Netherlands Navy makes use of a sheet of pieces we produced, in prodigious quantity, for a long-out-of-print supplement called Spice Islands. Other than sharing those pieces, the two works have little in common; both include a Dutch fleet more in keeping with the Netherlands’ economic and industrial strength – therefore much more powerful than the one actually in place when war came to the Netherlands East Indies in late 1941. Here's a look at more toys from Royal Netherlands Navy, wrapping up the overview started in Part 1. The Royal Netherlands Navy did obtain aircraft carriers, but not until after the Second World War. They don't seem to have seriously studied building them before the war, but I wanted them to have them in the game — one of the underlying purposes of the scenario design was to let players fight with more-or-less evenly matched forces on the wonderful Strike South maps. There are three light carriers provided, improved and enlarged versions of the British Hermes. Ships like this were studied by the Royal Navy and particularly by the Royal Canadian Navy — Sir John Jellicoe, the victor of Jutland, pressed hard for this type of aircraft carrier during the 1920s. The Dutch were probably aware of the Jellicoe recommendations regarding Canada's fleet plans, but I have no evidence that they looked at the Improved Hermes concept. Aircraft carriers need airplanes. The Dutch East Indies forces, to a much greater extent than those of the homeland, looked to American manufacturers for aircraft and I went with the hypothesis that they'd have done to same to fill their carrier decks. The carriers field Wildcat fighters and Vindicator dive bombers — many small carriers did not have armored stowage for torpedoes and did not field torpedo bombers, and I extended that principle to the Dutch as well. The Dutch embraced the light cruiser as a compromise between their defense needs and their unwillingness to spend large sums on the fleet. And usually these ships showed all the problems of a compromise, summed up in the light cruiser De Ruyter, the Dutch flagship during the actual battles of 1942. De Ruyter had initially been intended as a heavy cruiser, bearing 8-inch guns. But in an effort to save money, she was downgraded to 6-inch guns and greatly reduced in size. Only one unit was built instead of the four initially considered, and so we had her three unbuilt sisters in the Spice Islands mix (and thus in Royal Netherlands Navy), the Gelderland class. The De Ruyter drawing has received a major upgrade from Strike South. We also have her heavy cruiser guise, with six 8-inch guns and a heavier anti-aircraft battery. Dutch ships usually carried a heavier anti-aircraft suite than comparable ships in other navies, and boasted the sophisticated Hazemeyer control system that boosted their effectiveness. The De Kock class is only a weak heavy cruiser, however, and not the sort of upgrade provided by the big Aemilla class described in part one of this overview. They're named for the Dutch leaders who conquered the East Indies. When the Dutch finally started to build up their surface forces, they ordered a pair of flotilla leaders to support them in battle with heavier weapons and to serve as flagships. Since we gave the Dutch a large number of destroyers in Royal Netherlands Navy, there needed to be flotilla leaders for them, and so we have four copies of the leader Tromp, here christened the Utrecht class. Finally, there's one forlorn Great War-era light cruiser, Celebes. Never completed, she's a sister of Java and Sumatra found in Strike South. The Dutch relied heavily on their destroyer flotilla during the actual battles, and they come well-equipped in Royal Netherlands Navy. There are 20 of the Gerard Callenbergh class boats, a type actually designed and built at the outbreak of World War II. But plans included two full flotillas of them, only four of which would be laid down (as the Tjerk Hiddes class). Isaac Sweers served the Allies while Callenbergh was seized by the Nazis and incorporated into their navy; the other two were broken up incomplete. Keeping with the original Dutch design, they each carry a seaplane — highly unusual in the Second World War at Sea series. All are named for Dutch naval heroes. Aware of the Japanese "Special Type" destroyers, the Dutch considered building a destroyer maximized for surface combat but instead went with the balanced Tjerk Hiddes design. Not constrained by the bounds of reality, in Royal Netherlands Navy the Dutch get this ship as well. The Zeeslang class have a heavy gun and torpedo armament and are large destroyers, not much smaller than the flotilla leaders. They carry the names of Dutch torpedo boats of the early 20th century. While the Netherlands had a vibrant aircraft industry of their own, they imported most of their planes for the Dutch East Indies. The Dutch get fairly powerful air forces, in keeping with their East Indies defense plans. They have P-40 and Hurricane fighters, plus Mosquito and Lightning heavy fighters. The Dutch liked the Mosquito in fighter configuration though they never actually ordered it, and used both P-40s (Kittyhawk) and Hurricanes during the war, so those three are very solidly grounded in our reality. In the attack category, the Dutch have two British planes, the Blenheim and Beaufort, both of which they actually operated in the theater — just not in these numbers. The Fortress (B-17) is something of a stretch; the Dutch had seen and admired them but the Americans were not exporting this fine plane before the war. And that's the real "alternative" in the aircraft category: all of the planes shown were at least studied by the Dutch and most of them actually flown by them. But in just about every case, all production went to the domestic air force (British or American) with none left over for third parties. The Dutch would have liked these planes and could have bought them — but no one was selling. In the Second Great War setting, the United States is neutral, trading with all. The Royal Netherlands Navy relied on big flying boats for reconnaissance, and operated both the Dornier Do.24 and Consolidated Catalina in the East Indies. Royal Netherlands Navy simply gives them more of these fine planes. 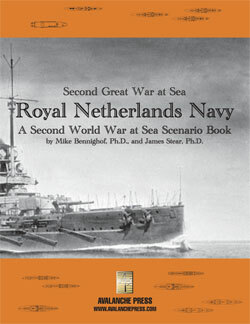 Click here to order Royal Netherlands Navy right now! Mike Bennighof is president of Avalanche Press and holds a doctorate in history from Emory University. A Fulbright Scholar and award-winning journalist, he has published over 100 books, games and articles on historical subjects. He lives in Birmingham, Alabama with his wife, three children and his dog, Leopold. Leopold likes to visit Dogpark.